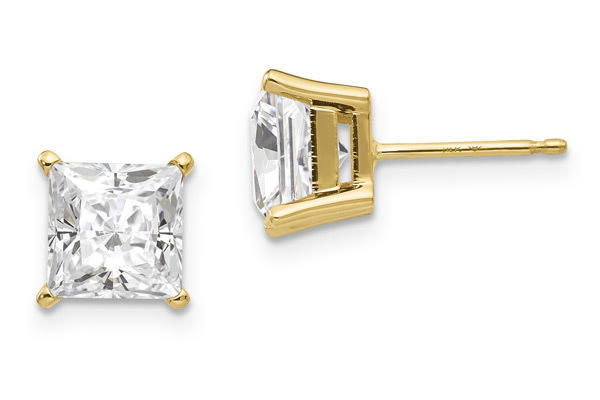 Brilliant 2.36 carat moissanite princess-cut stud earrings crafted in 14k solid yellow gold, set in classic 4-prong basket settings. The moissanite stud earrings house 1.18 carats per ear and come with secure, friction-post push-back settings. The moissanite stones are a quality brilliant-cut G-H color. Our stud earring are hand-set in the U.S.A.
Also available in various carat weights and metal colors, shown below. We guarantee our 2.36 Carat Moissanite Princess-Cut Stud Earrings in 14K Yellow Gold to be high quality, authentic jewelry, as described above.